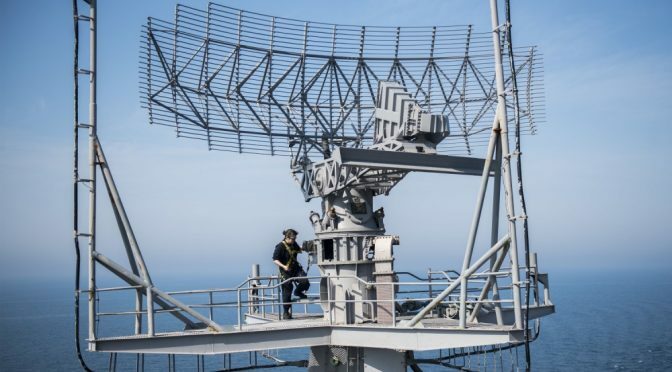 Most Navy bridge watchstanders have had the experience of adjusting their surface-search radar to eliminate sea clutter or rain. In relation to the task of detecting surface ships, these artifacts represent “noise,” just as when one tunes out unwanted transmissions or static to improve radio communications. However, information can be gleaned indirectly from unintentionally received signals such as these to yield details about the operating environment, and it may reveal the presence, capabilities, and even intent of an adversary. This “electromagnetic bycatch” is a potential gold mine for the Navy’s information warfare community (IWC) in its drive to achieve battlespace awareness, and represents a largely untapped source of competitive advantage in the Navy’s execution of electromagnetic maneuver warfare (EMW). The amount of fisheries bycatch is significant, with annual global estimates reaching twenty million tons.2 Navy sensor systems also receive a significant volume of bycatch, as evidenced by efforts to drive down false-alarm rates, operator training to recognize and discard artifacts on system displays, and the extensive use of processing algorithms to filter and clean sensor data and extract the desired signal. Noise in the sensor’s internal components may necessitate some of this processing, but many algorithms aim to remove artifacts from outside the sensor (i.e., the sensor is detecting some sort of phenomenon in addition to the targeted one). U.S. and international efforts are underway to reduce fishing bycatch by using more-selective fishing gear and methods.3 Likewise, there are efforts to reduce electromagnetic bycatch, with modifications to Navy sensors and processing algorithms via new installations, patches, and upgrades. However, it is unlikely that either form of bycatch ever will be eliminated completely. Recognition of this within the fishing industry has given rise to innovative efforts such as Alaska’s “bycatch to food banks” program that allows fishermen to donate their bycatch to feed the hungry instead of discarding it at sea.4 This begs the question: Can the Navy repurpose its electromagnetic bycatch too? The answer is yes. Navy leaders have called for innovative ideas to help meet twenty-first century challenges, and do to so in a constrained fiscal environment. At the Sea-Air-Space Symposium in 2015, Admiral Jonathan W. Greenert, then-Chief of Naval Operations, called for the Navy to reuse and repurpose what it already has on hand.5 Past materiel examples include converting ballistic-missile submarines to guided-missile submarines; converting Alaska-class tankers to expeditionary transfer docks (ESDs), then to expeditionary mobile bases (ESBs); and, more recently, repurposing the SM-6 missile from an anti-air to an anti-surface and anti-ballistic missile role.6 However, the Navy needs to go even further, extending this mindset from the materiel world to the realm of raw sensor data to repurpose electromagnetic bycatch. The potential value of bycatch that U.S. fisheries alone discard exceeds one billion dollars annually (for context, the annual U.S. fisheries catch is valued at about five billion dollars).7 Likewise, the Navy previously has found high-value signals in its electromagnetic bycatch. However, this appeal fell on deaf ears; the idea was not considered worthy of additional study. Later, in 1930, after it was demonstrated that aircraft also could be detected, the newly formed Naval Research Laboratory (NRL) moved forward and developed the early pulsed radio detection systems whose successors are still in use today.10 What started as degradations in radio communication signals (owing to objects blocking the propagation path) evolved to being the signal of interest itself. Today that bycatch is used extensively for revealing the presence of adversaries, navigating safely, and enforcing the speed limit. It is known as RAdio Detection And Ranging, or simply by its acronym: RADAR. During World War II, Navy radar and radio receivers became increasingly sensitive and began picking up stray signals from around the world. Instead of discarding these signals, the Navy set out to collect them. 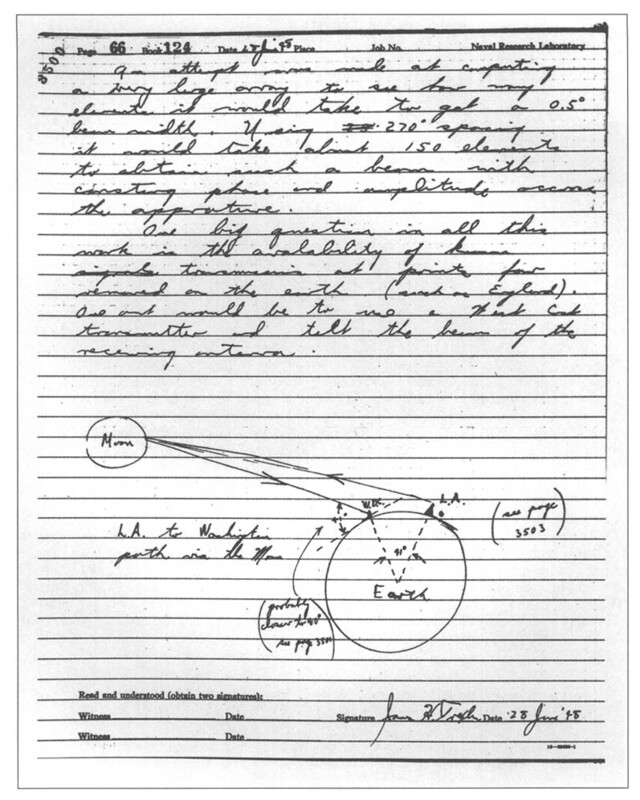 The NRL Radio Division had been investigating this phenomenon since the mid-1920s, and in 1945 NRL established a Countermeasures Branch, which had an interest in gathering random signals arriving via these “anomalous propagation” paths.11 By 1947, it had erected antennas at its Washington, DC, field site to intercept anomalous signals from Europe and the Soviet Union.12 Just the year before, the Army Signal Corps had detected radio waves bounced off the moon. The convergence of these events set the stage for one of the most innovative operations of the Cold War. Around this time, the Navy grew concerned about ionospheric disturbances that affected long-range communications.15 So the service employed the new moon-bounce propagation path to yield another Navy capability, the communications moon relay. This enabled reliable communications between Washington, DC, and Hawaii, and later the capability to communicate to ships at sea.16 Thus, what started as bycatch led to a search for the sources of stray signals, revealed adversary air- and missile-defense capabilities, and ultimately led to new communications capabilities for the Navy. Signals in the electromagnetic spectrum do not propagate in straight lines. Rather, they refract or bend on the basis of their frequency and variations in the atmospheric properties of humidity, temperature, and pressure. Signals can encounter conditions that direct them upward into space, bend them downward over the horizon, or trap them in ducts that act as wave guides. Knowing this electromagnetic terrain is critical to success in EMW, and can prove instrumental in countering adversary anti-access/area-denial capabilities. Variation in electromagnetic propagation paths can lead to shortened or extended radar and communications ranges. Depending on the mission and the situation, this can be an advantage or a vulnerability. Shortened ranges may lead to holes or blind spots in radar coverage. This information could drive a decision for an alternate laydown of forces to mitigate these blind spots. It also could aid spectrum management, allowing multiple users of the same frequency to operate in closer proximity without affecting one another. Alternatively, extended radar ranges can allow one to “see” farther, pushing out the range at which one can detect, classify, and identify contacts. Signals of interest could be collected from more distant emitters. However, the adversary also can take advantage of extended ranges and detect friendly forces at a greater distance via radar, or passively collect friendly emissions. Identifying this situation could prompt one to sector, reduce power, or secure the emitter. As the weather constantly changes, so too does signal propagation and the resultant benefit or vulnerability. Understanding these effects is critical to making informed decisions on managing emitters and balancing sensor coverage against the signature presented to the adversary. However, all these applications rely on sufficient meteorological data, which typically is sparse in space and time. More frequent and more distributed atmospheric sampling would give the U.S. Navy more-complete awareness of changing conditions and increase its competitive advantage. By passively using the existing radar feeds, HWDDC and TEP provide new capabilities while avoiding additional requirements for power, space, frequency deconfliction, and overall system integration that would be associated with adding a new radar, antenna, or weather sensor. There also is the potential to extract refractivity data from the radar returns of sea clutter.20 The multitude of radar platforms in the Navy’s inventory represents an untapped opportunity to conduct “through the sensor” environmental data collection in support of battlespace awareness. There is also great potential to harvest bycatch from routine broadcast signals. While a traditional radar system emits its own pulse of energy that bounces back to indicate the presence of an object, passive systems take advantage of signals already present in the environment, such as television and radio broadcasts or even signals from cell towers or GPS.23 These signals propagate, encounter objects, and reflect off. This leads to the “multipath effect,” in which a transmitted signal bounces off different objects, then arrives at the same receiver at slightly different times owing to the varied distances traveled. (This is what used to cause the “ghost” effect on television, in which an old image seemed to remain on screen momentarily even as the new image was displayed.) Variations in this effect can be used to infer the presence or movement of an object that was reflecting the signals. In a related concept, “multistatic” systems collect these reflections with multiple, geographically separated receivers, then process the signals to detect, locate, and track these objects in real time.24 These systems have proved effective. In a 2002 demonstration, Lockheed Martin’s Silent Sentry system tracked all the air traffic over Washington, DC, using only FM radio and television signal echoes.25 More recently, another passive system went beyond simple tracking and actually classified a contact as a small, single-propeller aircraft by using ambient FM radio signals to determine its propeller rotation rate.26 This level of detail, combined with maneuvering behavior, operating profiles, and deviations from associated pattern-of-life trends, could even give clues to adversary intent. Passive radar systems have many advantages. They emit no energy of their own, which increases their survivability because they do not reveal friendly platform location and are not susceptible to anti-radiation weapons. They do not add to a crowded spectrum, nor do they need to be deconflicted from other systems because of electromagnetic interference. The receivers can be mounted on multiple fixed or mobile platforms. Technological advances in processing and computing power have taken much of the guesswork out of using passive systems by automating correlation and identification. Moving forward, there is great potential to leverage radar-like passive detection systems. Among the services, the Navy in particular has the potential to gain much from harvesting the electromagnetic bycatch. During war or peace, the Navy operates forward around the world, providing it unique access to many remote locations that are particularly sparse on data. Use of ships provides significant dwell time on station without requiring basing rights. Navy platforms tend to be sensor intensive, and so provide the means for extensive data collection. This extends from automated, routine meteorological observations that feed near-term forecasts and long-term environmental databases to preconflict intelligence-gathering applications that include mapping out indigenous signals for passive systems to use later.28 The mobility of Navy platforms allows for multiple units to be brought to bear, scaling up the effect to create increased capacity when necessary. However, there are many challenges to overcome. The Navy soon may find itself “swimming in sensors and drowning in data”; managing this information will require careful consideration.29 Returning to the fishing analogy, to avoid wasting bycatch fishermen need to identify what they have caught in their nets, find someone who can use it, temporarily store it, transport it back to port, and get it to the customer before it spoils. Likewise, the Navy needs to dig into the sensor data and figure out exactly what extra information it has gathered, identify possible applications, determine how to store it, transfer it to customers, and exploit it while it is still actionable. History has shown that this is a nontrivial task; remember that the original discovery and proposed application of radar were dismissed. If the unplanned signal is determined to have no current use, it should be noted for possible future exploitation. Subsequent sensor upgrades, algorithm improvements, and software patches then should strive to eliminate the signal from future incidental collection. If there is potential value in the incidental signal, upgrades, algorithms, and patches should optimize its continued reception along with the original signal via the same sensor, or possibly even demonstrate a requirement for a new sensor optimized for the new signal. The identified uses for the electromagnetic bycatch will drive the follow-on considerations of what and how much data to store for later exploitation and what data needs to be offloaded immediately within the limited bandwidth owing to its value or time sensitivity. The analogy to fisheries bycatch also raises a regulatory aspect. Much as a fisherman may find that he has caught a prohibited catch (possibly even an endangered species) that he cannot retain, the same holds true for electromagnetic bycatch. It is possible that an incidental signal might reveal information about U.S. citizens or entities. Once the signal is identified, intelligence oversight (IO) requirements would drive subsequent actions. Navy IO programs regulate all Navy intelligence activities, operations, and programs, ensuring that they function in compliance with applicable U.S. laws, directives, and policies.31 IO requirements likely would force the SYSCOM to alter the sensor’s mode of operation or develop upgrades, algorithms, and patches to avoid future collection of the signal. The Navy’s IWC is ideally suited to play a key role in responding to these challenges. Its personnel have experience across the diverse disciplines of intelligence, cryptology, electronic warfare, meteorology and oceanography (METOC), communications, and space operations, and assembling these different viewpoints might reveal instances in which one group can use another’s bycatch for a completely different application. IWC officers now come together to make connections and exchange expertise in formal settings such as the Information Warfare Basic Course and the Information Warfare Officer Milestone and Department Head Course. Further cross-pollination is increasing owing to the cross-detailing of officers among commands of different designators. Recent reorganization of carrier strike group staffs under the Information Warfare Commander construct has increased and institutionalized collaboration in operational settings. Restructuring has trickled down even to the platform level, where, for example, the METOC division has been realigned under the Intelligence Department across the carrier force. As a net result of these changes, the IWC has a unique opportunity to have new eyes looking at the flows of sensor data, providing warfighter perspectives in addition to the SYSCOM sensor review described above. The Navy also can capitalize on the collective IWC’s extensive experience and expertise with issues pertaining to data collection, processing, transport, bandwidth management, archiving, and exploitation. Furthermore, the different components of the IWC share a SYSCOM (the Space and Naval Warfare Systems Command, or SPAWAR); a resource sponsor (OPNAV N2/N6); a type commander (Navy Information Forces); a warfighting-development center (the Navy Information Warfighting Development Center); and a training group (the Navy Information Warfare Training Group will be established by the end of 2017). This positions the IWC to collaborate across the doctrine, organization, training, materiel, leadership and education, personnel, and facilities (DOTMLPF) spectrum. This will support shared ideas and unified approaches regarding the employment of emerging capabilities such as the machine-learning and “big-data” analytics that will sift through future electromagnetic bycatch. Ultimately, the members of the IWC can forge a unified way forward to develop the next generation of sensors, data assimilators, and processors. While the Navy might not recognize exactly what it has, its sensors are collecting significant amounts of electromagnetic bycatch. The Navy’s forward presence positions it to collect volumes of unique data with untold potential. The associated electromagnetic bycatch is being used now, previously has yielded game-changing capabilities, and could do so again with future applications. Instead of stripping and discarding it during data processing, the Navy needs to take an objective look at what it can salvage and repurpose to gain competitive advantage. The fishing bycatch dumped every year could feed millions of people; the Navy needs to use its electromagnetic bycatch to feed new capabilities. Don’t dump it! The ideas presented are those of the author alone and do not reflect the views of the Department of the Navy or Department of Defense. Magnuson-Stevens Fishery Conservation and Management Act of 1976, 16 U.S.C. § 1802 (2) (1976), available at www.law.cornell.edu/. United Nations, International Guidelines on Bycatch Management and Reduction of Discards (Rome: Food and Agriculture Organization, 2011), p. 2, available at www.fao.org/. Ibid., p. 13; Lee R. Benaka et al., eds., U.S. National Bycatch Report First Edition Update 1 (Silver Spring, MD: NOAA National Marine Fisheries Service, December 2013), available at www.st.nmfs.noaa.gov/. Laine Welch, “Gulf Bycatch Will Help Feed the Hungry,” Alaska Dispatch News, June 4, 2011, www.adn.com/; Laine Welch, “Bycatch to Food Banks Outgrows Its Beginnings,” Alaska Fish Radio, August 3, 2016, www.alaskafishradio.com/. Sydney J. Freedberg Jr., “Tablets & Tomahawks: Navy, Marines Scramble to Innovate,” Breaking Defense, April 13, 2015, breakingdefense.com/. Sam Lagrone, “SECDEF Carter Confirms Navy Developing Supersonic Anti-Ship Missile for Cruisers, Destroyers,” USNI News, February 4, 2016, news.usni.org/; Missile Defense Agency, “MDA Conducts SM-6 MRBM Intercept Test,” news release, December 14, 2016, www.mda.mil/. Amanda Keledjian et al., “Wasted Cash: The Price of Waste in the U.S. Fishing Industry,” Oceana (2014), p. 1, available at oceana.org/. David Kite Allison, New Eye for the Navy: The Origin of Radar at the Naval Research Laboratory, NRL Report 8466 (Washington, DC: Naval Research Laboratory, 1981), p. 39, available at www.dtic.mil/. “Development of the Radar Principle,” U.S. Naval Research Laboratory, n.d., www.nrl.navy.mil/. David K. van Keuren, “Moon in Their Eyes: Moon Communication Relay at the Naval Research Laboratory, 1951–1962,” in Beyond the Ionosphere, ed. Andrew J. Butrica (Washington, DC: NASA History Office, 1995), available at history.nasa.gov/. Frank Eliot, “Moon Bounce ELINT,” Central Intelligence Agency, July 2, 1996, www.cia.gov/. SPAWAR Systems Center Pacific, “Hazardous Weather Detection & Display Capability (HWDDC),” news release, n.d., www.public.navy.mil/; Timothy Maese et al., “Hazardous Weather Detection and Display Capability for US Navy Ships” (paper presented at the 87th annual meeting of the American Meteorological Society, San Antonio, TX, January 16, 2007), available at ams.confex.com/. Tim Maese and Randy Case, “Extracting Weather Data from a Hybrid PAR” (presentation, Second National Symposium on Multifunction Phased Array Radar, Norman, OK, November 18, 2009), available at bcisensors.com/. Hank Owen, “Tactical Environmental Processor At-Sea Demonstration,” DTIC, 1998, www.handle.dtic.mil/. Ted Rogers, “Refractivity-from-Clutter,” DTIC, 2012, www.dtic.mil/. Richard B. Langley, “Innovation: Better Weather Prediction Using GPS,” GPS World, July 1, 2010, gpsworld.com/. Steven Businger, “Applications of GPS in Meteorology” (presentation, CGSIC Regional Meeting, Honolulu, HI, June 23–24, 2009), available at www.gps.gov/; Tracy Lorraine Smith et al., “Short-Range Forecast Impact from Assimilation of GPS-IPW Observations into the Rapid Update Cycle,” Monthly Weather Review 135 (August 2007), available at journals.ametsoc.org/; Hans-Stefan Bauer et al., “Operational Assimilation of GPS Slant Path Delay Measurements into the MM5 4DVAR System,” Tellus A 63 (2011), available at onlinelibrary.wiley.com/. Lockheed Martin Corp., “Lockheed Martin Announces ‘Silent Sentry(TM)’ Surveillance System; Passive System Uses TV-Radio Signals to Detect, Track Airborne Objects,” PR Newswire, October 12, 1998, www.prnewswire.com/; Otis Port, “Super-Radar, Done Dirt Cheap,” Bloomberg, October 20, 2003, www.bloomberg.com/. Lockheed Martin Corp., “Silent Sentry: Innovative Technology for Passive, Persistent Surveillance,” news release, 2005, available at www.mobileradar.org/. F. D. V. Maasdorp et al., “Simulation and Measurement of Propeller Modulation Using FM Broadcast Band Commensal Radar,” Electronics Letters 49, no. 23 (November 2013), pp. 1481–82, available at ieeexplore.ieee.org/. Thomas Rowden [Vice Adm., USN], Peter Gumataotao [Rear Adm., USN], and Peter Fanta [Rear Adm., USN], “Distributed Lethality,” U.S. Naval Institute Proceedings 141/1/1,343 (January 2015), available at www.usni.org/. “Automated Shipboard Weather Observation System,” Office of Naval Research, n.d., www.onr.navy.mil/. Stew Magnuson, “Military ‘Swimming in Sensors and Drowning in Data,’” National Defense, January 2010; www.nationaldefensemagazine.org/. U.S. Navy Dept., Naval Science and Technology Strategy: Innovations for the Future Force (Arlington, VA: Office of Naval Research, 2015), available at www.navy.mil/. “Intelligence Oversight Division,” Department of the Navy, Office of Inspector General, n.d., www.secnav.navy.mil/.